“The Utility Man” – Top Five Rock multi-instrumentalists……. The prototype for the ‘jack of all trades’ band member. Brian Jones formed The Rolling Stones and was their nominal leader until all hell broke loose and the harsh light of celebrity took aim exclusively at Mick and Keef. Early on, Jones demonstrated his versatility playing authentic bottleneck slide guitar and blues harp in addition to adding back-up vocals. He later expanded his wild-card role by playing sitar (Paint It Black), piano and flute (Ruby Tuesday), dulcimer (Lady Jane), Hammond organ (Out Of Time), mellotron and saxophone (The Citadel), Vibraphone (Under My Thumb) and other contributions on percussion and guitar too numerous to mention. 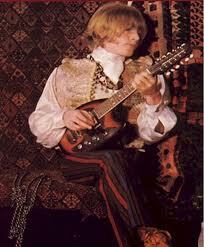 When Jones died (at age 27) in 1969, any spirit of musical adventure that lay inside The Rolling Stones died with him. Mick Taylor famously stepped in on guitar and saved the band. But, it was a different band without Brian Jones. One of the secrets to the success of The Beatles (including George Martin) lie in the fact that they were self contained. They wrote, played and arranged all the core elements of the band’s sound. Paul McCartney was third banana on guitar early in the group’s history. His switch to bass was unselfish, but also a no-brainer. 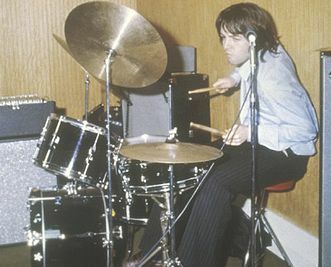 For a control freak like McCartney, commanding the vocal mic and helming the rhythm section was his dream gig. As The Beatles muse evolved in the hot-house environment of London’s EMI studios, so did McCartney’s musicianship. A capable, inventive guitarist, (Blackbird, Drive My Car, Junk) and a superior pianist (Lady Madonna, Maybe I’m Amazed, Martha My Dear); McCartney also filled in on drums when necessary (Back In The USSR, Ballad Of John And Yoko). Recent tours have seen Paul add Ukulele to his bag of tricks. Safe to say Paul was band MVP from Revolver up until Abbey Road; an album nearly stolen by George Harrison. 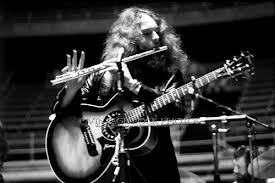 The leader and visionary of Jethro Tull started out as a guitar player but took up flute because of the instrument’s portability. He learned the instrument by transposing blues guitar riffs to flute as counterpoint to Tull’s master bluesman (guitarist) Mick Abrahams. After Abraham’s departure from Tull, Anderson seized full control and took a stylistic 90 degree turn on the band’s next album “Stand-Up”. On “Stand-Up”, Anderson was the lone star; establishing his brand on flute as well as playing the delicate arpeggiated acoustic guitar that would become one of the band’s signature elements. Additionally, he turned the album into a folk-rock toure’ de force by playing mandolin, balalaika, and Hammond organ. One of the boldest mission statements by any musician, in any band, in any decade. On later albums; “Thick as a Brick” and “Passion Play”, Anderson would add violin, trumpet, and soprano sax to his toolbox. Led Zeppelin made albums that sounded massive. Then they were expected to replicate that layered sound live. They made things even harder on themselves by choosing to remain a three piece instrumental unit. 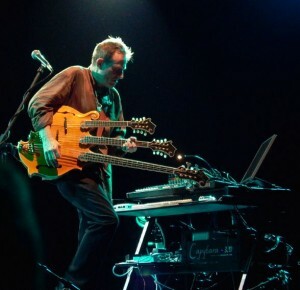 They were able to pull it off thanks to bassist/keyboardist/mandolinist John Paul Jones. Jones was a battle tested veteran of the London studio scene with Donovan long before The New Yardbirds were a twinkle in Jimmy Page’s eye. Onstage, Jones thunders riff for riff with Jimmy Page on bass and adds colors and orchestral gravitas on keyboards. And, in Zeppelin’s unplugged moments, Jones sits in on mandolin. Is Jones replaceable as a member of Led Zeppelin? Well…..last time Page and Plante got together for an album and tour they called the project Page/Plante. They didn’t dare call it Led Zeppelin without Jones onboard. Listen to “In Through The Out Door”; It’s pretty much Jonesy’s album; the epic “Kashmir” being one of his finest moments. Polar opposite to his brother Johnny; Edgar was neither a blues purist nor guitar player. 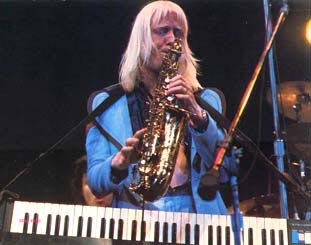 Edgar Winter earned his spurs with the band White Trash on the club and roadhouse circuit before he formed The Edgar Winter Group and went mega. Winter stunned the music world with his androgynous image and his staggering virtuosity on Vocals, Keyboards, Saxophone and Percussion. “They Only Come Out At Night” by The Edgar Winter Group is a seminal 1970’s classic rock album. Winter’s biggest hit was also his strangest. For the instrumental “Frankenstein”, Winter leaves it all on the playing field. Playing keyboards strapped to his body like a guitar player, then playing the horn section on alto sax, then matching drummer Chuck Ruff crush roll for crush roll during the call-and-response drum solo, culminating in a abstract ARP 2600 synthesizer white-noise freak-out. Comfortable as lead man or backing musician (Ringo Starr, Michael McDonald), Edgar is my first round draft pick when assembling my dream band. Regarding Emitt, you put it perfectly. Thank you.